My Faculty Academy presentation “Being There: nets, tweets, avatars” is getting some eyeballs where it is sitting in slideshare. I am blushing, this dog is shy and hates attention. I might need to take a bath now or comb my hair. I like what slideshare does, that it can YouTube like be embedded into web pages and blog posts and is the only, only, ONLY, O-N-L-Y reason I would ever touch Powerpoint, but with its lack of embedding URLs, it really is less useful as a sharing platform than the slides posted in flickr. 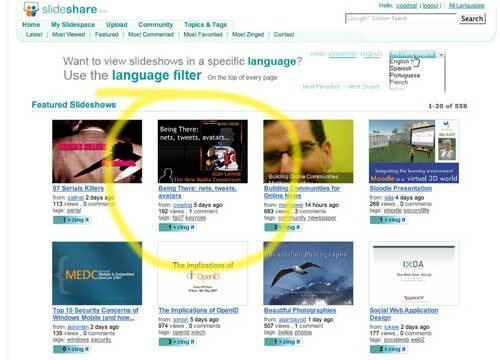 C’mon, slideshare, give us hyperlinks! But slideshare DOES allow embedded hyperlinks. Check out one of mine, chock full of links on almost every slide … all clickable. You just have to keep them in a little towards the centre of the slide otherwise the [forward] and [backward] feature overrides them. I really love slideshare. Loved your presentation on flickr. The additional text you included on flickr is what really made the experience for me. Another alternative might be SplashCast or BubbleShare they allow you to include audio for each slide. SplashCast is particularly versatile, allowing for all sorts of embedded multimedia. Thanks for the clarification, Darren. Is there somewhere this is explained on slideshare? Frankly, I see little reason for overlaying next/back hot links *on the content* when there are buttons to handle that – I did not take that into consideration. Would also be nice if SS took the content from the notes and included it on the slide captions. I pretty much copies and pasted by speaker notes form PPT (I dont use them during the session but for practice). Enjoyed your presentation. As Darren mentioned, we do allow links, though we need to make that more discoverable. I am also thinking that we should have a wiki or something where we and SlideShare users can add add tips like this. (FAQs are so hard to keep updated). Also, we are planning to add ability to grab notes. In the meantime, I try to get trick the system by adding text under the images on the PowerPoint (the text cannot be seen, but its picked up in the transcript). So, I’m cruising through your presentation on Flickr and I’m on slide 8 or 9 (Facing the Future) and I follow the link to Flickr Creative Commons and I search on “conference” and sort by Most Interesting and Boom, what catches my eye but the 8th thumbnail down and it is a photo by D’Arcy Norman. I love how small the world is. Hey Jim, nice to hear from you! How are things up Oregon way? Yeah, that D’Arcy guy is all over the big wide web. Thanks for the nudge on Zoho- its got some nice features.